Days of Thunder: NASCAR Edition was presumably delisted from the PlayStation 3 in early July 2013 alongside the Xbox 360 version (Days of Thunder: Arcade) according to reporting from TrueAchievements.com. The PlayStation Portable version (as Days of Thunder minis) was likely delisted around this same timeframe. “In Days of Thunder: NASCAR Edition, players join Rowdy Burns’ team as the latest rookie to tear up the NASCAR circuit. With Rowdy as their coach, players learn to hit the pit, upgrade their ride and trade paint with other cars. They can even “drop the hammer” like Cole Trickle for a boost of extra speed. Rowdy Burns is voiced by the actor from the film, Michael Rooker. 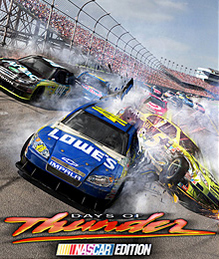 Days of Thunder: NASCAR Edition comes equipped with twelve NASCAR-sanctioned tracks, including Daytona International Speedway® and Talladega Superspeedway®.